As the end of phase 1 approaches, it is time to remind of phase 1 key achievements. The approach of the PPP projects and programme Golden Nuggets was initiated mid-2016, starting first with the definition of the key projects achievement after Year 1. The projects Golden Nuggets were collected on individual basis and reviewed at programme level (Technology Board) before the European Commission Year 1 annual review, to develop a 360° understanding of the overall Phase 1 projects portfolio achievements and allow the different projects to fully understand their individual contributions inside these global Phase 1 achievements. The overall approach of the PPP Programme Golden Nuggets was then defined and organized in 3 steps. It was decided to define top-down 10 (minimum) – 20 (maximum) PPP Phase 1 Programme Golden Nuggets at Technology Board level, considering the projects Golden Nuggets and the proposed categorization of major achievements (step 1). Followed the definition of the arborescence and the up-to-date definition of the projects Golden Nuggets under these programme Golden Nuggets (step 2). Then finally the implementation of the programme and projects Golden Nuggets on the PPP website, hyperconnecting the projects achievements to the projects websites and related documents (e.g. Deliverables, White Papers…) (step 3). The 15 PPP Phase 1 Programme Golden Nuggets are presented in the following figure, that was released in January 2017 and included in the PPP MWC 2017 White Paper “5G innovations for new business opportunities” and in several 5G-IA presentations since February 2017. Spectrum investigations and conclusions (METIS-II). Overall air interface evaluation framework (METIS-II). NGFI and RAN functional splits (5G-XHAUL). New waveforms adapted for service coexistence below 6 GHz (FANTASTIC-5G). Non-scheduled access for massive MTC (FANTASTIC-5G). Flexible interference mitigation for 5G below 6GHz – FDD & TDD (FANTASTIC-5G). Advanced RRM interacting with higher-level entities, enabling operator spectrum policy management for all types of regulatory regime (SPEED-5G). Flexible and adaptive multi-RAT MAC for dynamic spectrum access and aggregation (SPEED-5G). Multiband base stations < 6 GHz (Flex5Gware). Dynamic HW/SW function split (Flex5Gware). Automated physical and virtual infrastructure deployment (SELFNET). Establishment of a functional prototype platform featuring multitenancy and NFV and resource orchestration (SESAME). Management and orchestration (MANO) solution for integrated fronthaul and backhaul networks (5G-Crosshaul). Unified data plane solution for integrated fronthaul and backhaul networks (5G-Crosshaul). Fronthaul traffic compression (5-fold) (5G-Crosshaul). SDN wireless backhaul for ultra dense networks (5G-XHAUL). Hierarchical (blending distributed and centralized) management of ultra-dense multi-RAT and multiband networks (SPEED-5G). Policy management framework and code generator (CogNet). Process to apply machine learning models to policies (CogNet). Multi-level, multi-tenant-aware network monitoring (SELFNET). Flexible open-source service platform for NFV (SONATA). VNF placement at the edge of the network through appropriate GTP de/en-capsulation and steering of incoming traffic (SESAME). DevOps and CI/CD for NFV (SONATA). NFVO split into NSO-RO (5GEx). Initial deployment of sandbox test-bed connecting 13 sites (5GEx). Reusable Functional Block (RFB) concept and lightweight virtualization (Superfluidity). Integrated SDN and NFV apps management (SELFNET). Rapid software development for NFV (SONATA). KPI/SLA mapping and analytics pipeline (Superfluidity). Semantic description and symbolic execution of RFBs (Superfluidity). Breakdown of the multi-domain orchestration process (5GEx). 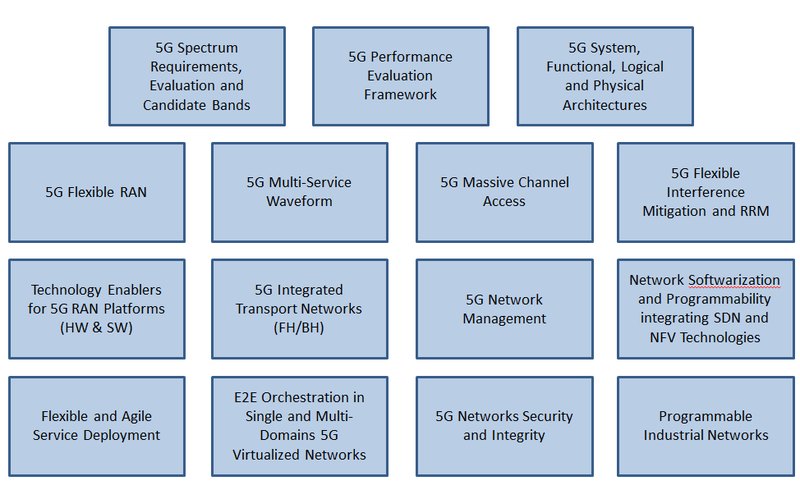 Service and domain aware (re)orchestration (5G-NORMA). Multi-tenant industrial capability via NFV (VirtuWind). Bottom-up proof of concept prototype (5GEx). SDN for programmable industrial networks (VirtuWind). Faster end-to-end (intra-, inter-domain) service deployment in industrial infrastructure (VirtuWind). The 5G Spectrum Workshop is organised in the context of CrownCom2017 that will take place on 20th-22nd September 2017 in Lisbon, Portugal. Research has shown that the fixed spectrum allocation policy commonly adopted today suffer from the low spectrum utilization problem. Academic and regulatory bodies have focused on dynamic spectrum access to fully utilize the scarce spectrum resource. Cognitive radio, with the capability to flexibly adapt its parameters, has been proposed as the enabling technology for future spectrum management. The 5G Spectrum Workshop will focus on creating discussion around the problems arisen in spectrum access, utilization, allocation and management, as well as validation and experimental results produced so far. ➧Click here for additional information. METIS-II will co-chair the track on 5G Radio and Wireless Communications. The tracks on Softwarisation and Virtualisation and Verticals, Services and Applications are both co-chaired by Flex5Gware. ➧For more info use the link. So far three Info Days are planned. The infodays will explain the nature of the different calls, share some suggestions on the nature of the projects expected, and – most important – give a the opportunity to present ideas and seek like-minded partners for proposals. ICT-25-2019: Advanced 5G validation trials across multiple vertical industries. Futurecom is the largest Telecom & IT Event in Latin America, with a special focus in Brazil. Its 19th Edition will be held in São Paulo, from October 2nd to 5th, at the Transamerica Expo Center. A Trade Fair with 22,000sqm receives representatives from 45 countries, and an outstanding International Congress has approximately 300 speakers and panelists and 5 conference rooms in 4 days. The previous Futurecom event counted with more than 300 exhibitors showing their products, solutions and applications for 13,500 unique attendees, in a great environment for business development. Most of Worldwide ICT companies exhibit at Futurecom, as well as Brazilian Fixed and Mobile Operators. Take part! Jean-Pierre Bienaimé, Secretary General of the 5G Infrastructure Association & Chairman of the 5G Initiative Steering Board will be there and make a presentation. ➧Click here or there to get more details! The 15th annual TU-Automotive EUrope Conference and Exhibition (6-7 November 2017, Münich) – Europe’s largest event for the connected car – will discuss how to harness advancements in technogloy like AI & Autonomy to deliver personalised, sustainable mobility. Past speakers include BMW, car2go, Renault, PSA and more. New features include round table and a start-up stage. The purpose of URLLC 2017 is to enable dialogue between vertical industries, mobile network operators, solution providers and the global standards bodies in order to give practical insights into what are essential and also realistic reliability and latency parameters for the various verticals and then explore the means by which these can be delivered across part or all of the wireless network infrastructure and with what cost and engineering premium.